Casey Perriccio August 20, 2018 funJason StathamRainn WilsonRuby RoseThe MegThe Officetwitter roundupWarner Bros. 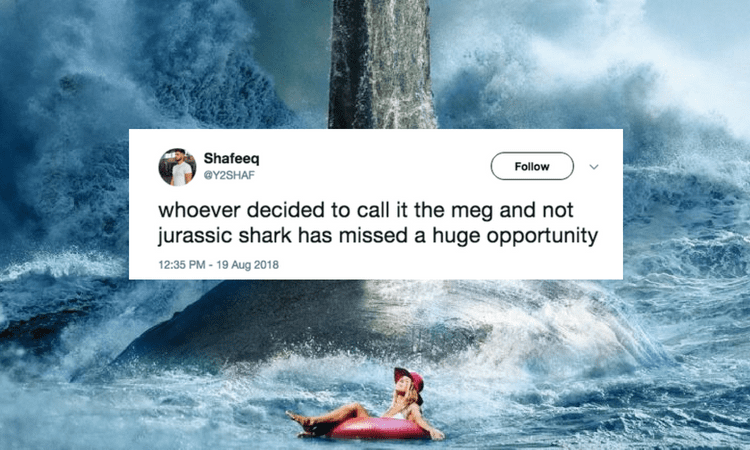 The Meg hit theaters last weekend to a Jaw-dropping box office opening, proving that Jason Statham, Dwight from The Office, and a giant shark were the perfect trio for a successful summer flick. Naturally, moviegoers took to Twitter to express their comedic commentary and thoughts on the often corny yet self-aware action film and we’ve gathered 19 of our favorites below. Check them out and if you haven’t seen The Meg yet, Jason Statham and all his shark slaying glory are still playing in theaters! I do love the slagging off that #TheMeg is getting from some people. Like I’m sorry, but who goes into a film that is basically Jason Statham kicking shite out of a massive shark and expects high art? The problem with casting Jason Statham is; he exudes physical competence. There was a scene in #TheMeg where he was in the water with regular sharks, and if he had grabbed a hammerhead and started swinging away at the rest, my suspension of disbelief would have been unaffected. I look forward to the Monday morning meetings on the Warner Bros. lot, where they eagerly discuss a way to make a #CrazyRichAsians /#TheMeg cross-over adventure. Caught a late night showing of #TheMeg. Fantastic performance from Pippin. The best part about The Meg was when Jason Statham punched the shark in the face and Seth Green fell out revealing it to be the long awaited sequel to The Italian Job. The Meg but instead of a movie about a shark it’s a movie about Megan from Drake and Josh. The Meg, but it’s a gigantic Meg Ryan trying to find true love in a relatively small city. The Meg is currently playing in theaters! Tags :funJason StathamRainn WilsonRuby RoseThe MegThe Officetwitter roundupWarner Bros.